Matt and Hayley have been working hard on new projects. One kid did it for a school assignment, the other is ignoring school assignments to work on her own personal idea. Remember the post I wrote about Matt looking for bugs for an insect collection? He finally finished it (a week early, so technically he could still find some more bugs and add to his collection, but he was tired of all the killing). Yay! I am done forever with dealing with kids who need to collect, kill, pin, and label insects! He didn't go much for decoration and layout; he just wanted to get the buggers pinned and labeled. I have very limited time today because a) I'm teaching seminary in less than an hour, b) then I have to go to work, c) and make one more lasagna for the d) pasta dinner tonight that we are hosting here and my house and e) I have to still bake the 6 lasagnas that I made yesterday and f ) cut up several pineapples snf g) clean this messy house AND 7) I teach seminary tomorrow too. So time...not so much of it to be found around here (I might have left some extra time under the bed or something. I hope I can get my hands on it). But I have these pictures of the fall drive Jim and I took last Saturday and I like them and want to put them up on my cyber wall to show everybody. 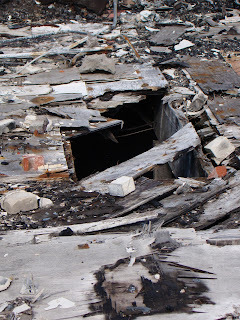 On our trip, we took a few minutes to explore a burned out restaurant. We wondered when it burned, and wondered why. After the burned out restaurant, I went closer to the beach (we were driving around Lake Mille Lacs) and snooped around an abandoned shack. while Jim strolled on the beach. I said I was going to post pictures of the fall drive trip Jim and I took after Paul's meet, but I'm not. I found a picture on facebook that I simply HAD to put on here. At home, Paul is very quiet; he rarely laughs, and almost never joins in games. He does have a subversive personality because I hear from Matt and Hayley constantly about all the times Paul is "mean" to them. I hardly ever catch Paul being mean, but I don't doubt the validity of Matt and Hayley's claims. 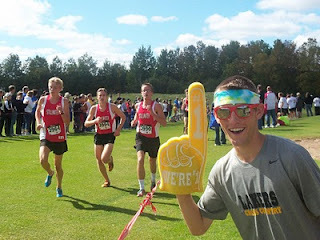 He and his CC friend decided to show fan support for another team during the JV race. He almost looks like a "creeper" or a photobomber. and around, and around again, and over another hill and behind some trees and finally into the chute at the finish line. Can you STAND more running pictures? Paul was the second Laker in and despite what he whined about--sore legs from standing all evening at a football game the night before and the course being SUPER hard--he kept his time under 18 minutes, 17:50 to be precise. He says he is done with times over 18 minutes (like it took him just to SAY he wasn't going to do it anymore). Next week is the pasta dinner at our house and the next day Paul will race in the home meet. I'm sure I'll have pictures of those two events too. But tomorrow...I might have pictures of a drive Jim and I took after the CC meet. Cross your fingers! Yes, it's just a piece of nonsense. But I do hear hints of red, yellow, and orange in the breeze. Fall is coming, and I am eagerly waiting for a Saturday drive through the leaves of Minnesota. With my camera, and with Jim, of course. Speaking of Jim, he and Other Jim are at a Twins' game. One of the last games of the season. They left without tickets, but with every confidence that there will be good seats available from scalpers or even the ticket office, if necessary. The Twins are bad, with a capital B, this year. It's a father/son outing. It would have been a father/son/mother outing, but somebody's gotta work. And it ain't the cats. Or maybe I wasn't invited. Oh well. I'll heat up some water for hot cocoa and sit at my desk and putter while I watch the yellowing going on outside my window. 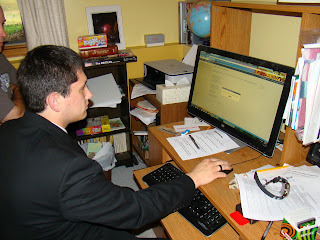 Other Jim has officially submitted his application to be a missionary for the Church of Jesus Christ of Latter-day Saints. The above picture is of him doing the actual submission. The last part of his submission was the photo to upload. He had to dress like a missionary. All he's missing is the name tag. Jim and I kept saying to each other all day, "Can you believe it? He wants to serve a mission. He actually got the paperwork and medical and dental exam done. Did you ever think that little boy who hated going to church and hated wearing church clothes and church shoes and church socks and was the cause of many headaches for his Primary teachers actually has applied to serve a mission?" He met with the Bishop yesterday and the last step will be an interview with the Stake President. And then we wait for the letter. Another last yesterday. 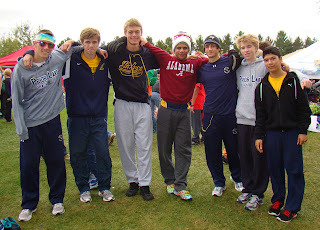 Paul ran his last Lakeville meet at Aronson Park. 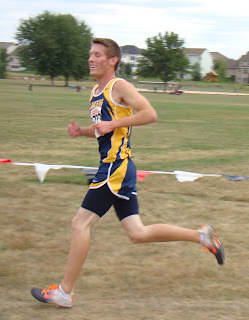 Fun story about Aronson Park: Couple years ago, maybe the first time Paul ran in the Lakeville meet, I drove to the park to see him run, but it was jam packed and I didn't know where to park. The Lakeville police were directing traffic, and, as I missed the turn into the crowded parking lot, I glanced at the cop. He looked just like my cousin Jurgan. I knew Jurgan was a volunteer officer for the Lakeville police, so I got myself turned around and drove back over to the entrance to the parking lot. And sure enough, my cousin was directing traffic! I slowed down to say hello and he was surprised to see me. We chatted for as long as we could while I was driving at 10 mph, then I had to go park. I never know when I'm going to run into a Talberg cousin! They are all over the place. I have no title for this post because I haven't thought about what I'm going to write. I guess I'll start off with a big ol' hug 'n thanks to Jim. Not my Jim; his dad. Hugs for coming out all this way to visit us. Hugs for enduring getting in and out of cars, Hugs for not pointing out my lack of organization and lack of attention to household matters. Hugs for coming to Paul's race. And thanks for the candy. It didn't last long. Also last weekend, and completely unrelated to the visit from Granddaddy, we learned that there exists a parasite that lives in grasshoppers and they emerge when the grasshopper dies. Matt was dismayed this past weekend when he opened his container of dead insects for his insect collection and found two long writhing whitish worm-like creatures where there had previously been none. He was even a little panicky. The dreaded 7th grade science project known as the insect collection is upon us for the last time. 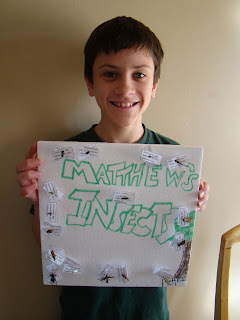 Matt came home from school yesterday moaning that he has to collect bugs. I don't know why he's moaning about it; he loves bugs and fiddling around in the grass, which are two main components of collecting insects. I guess doing it for fun is one thing, but being graded on what is normally something you do for fun kind of makes it a chore. Anyway, he made a makeshift butterfly net out of an old pillowcase and a hanger. He attached the pillowcase by stapling it around the end of the hanger. It seems to be functional. 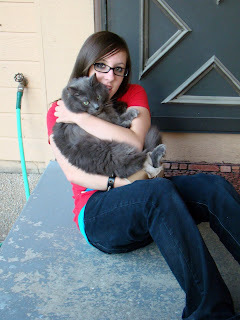 We went out for an evening walk, he and I, with the intent to do bodily harm to several insect orders. From work. For a few minutes. Although if I get a call, I'll have to go right back to work. Two feet away. 1. The return to school. No I didn't take pictures. You know what my kids look like. Imagine them frowning. That's what they looked like as they walked out the door to the bus/car. 2. Jim's dad is here til the end of the week. He brings chocolate and butterscotch suckers and See's candy. We like him a lot. 3. I'm wearing pants. Pants instead of shorts. It's been cool enough to wear pants instead of shorts and I like that. 4. I got my hair cut. It was way too long and frayed at the ends. Now my hair bounces and waves and acts like it is 21 again. 5. Other Jim sleeps during the day. And when he doesn't, I tell him "Go to bed! You have to work tonight!" He works 10 p.m. til 7 a.m.